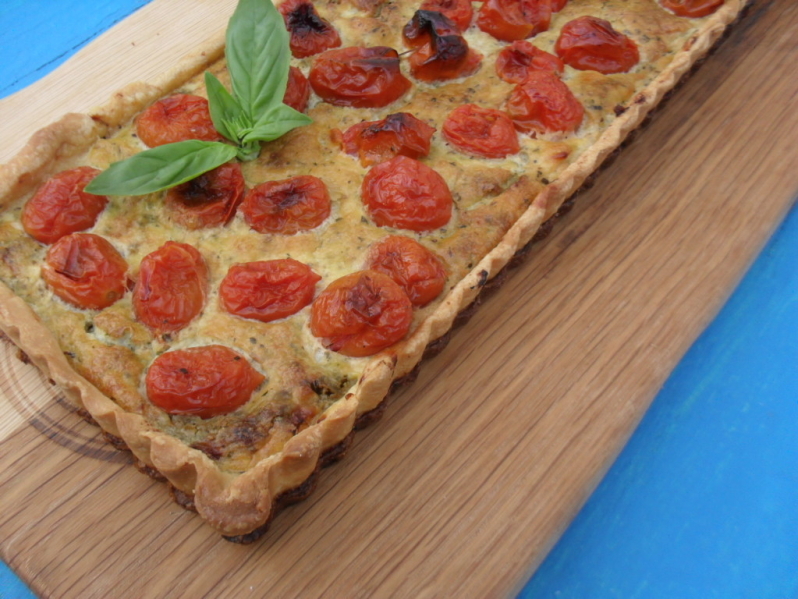 This tomato and basil pesto quiche has become one of my favourite dishes because it is quick and easy to prepare. People either love or hate quiche. My one daughter hates it; having to eat too many quiches in res at Stellenbosch University; she’s well and properly over it. To this day she swears that all the leftover food was scraped from the plates and made into a quiche. My other daughter loves quiche and she is of the opinion that quiche was one of the most decent meals served at lunch time at res at Stellenbosch! Her boyfriend asked her recently to bake something savoury for their cake sale at work. Apparently every division in the company has a month in which they host a cake sale and the proceeds go towards their year-end function. 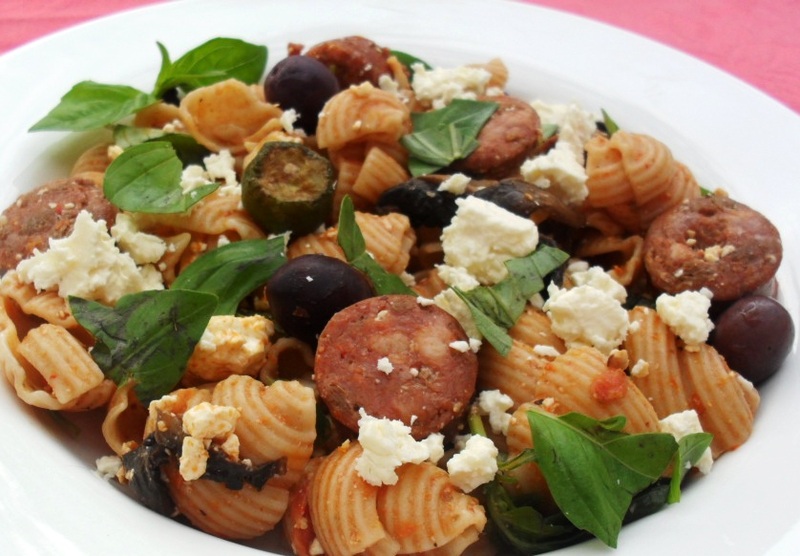 I have made it a number of times since then, serving it as a light meat-less lunch with a salad or as a side dish at a braai and I also served it at a family picnic recently. The pastry is an old, affordable one and can be prepared 1 or 2 days in advance and kept in the fridge. It’s well suited to be frozen, as well. The filling can be made in a couple of minutes. 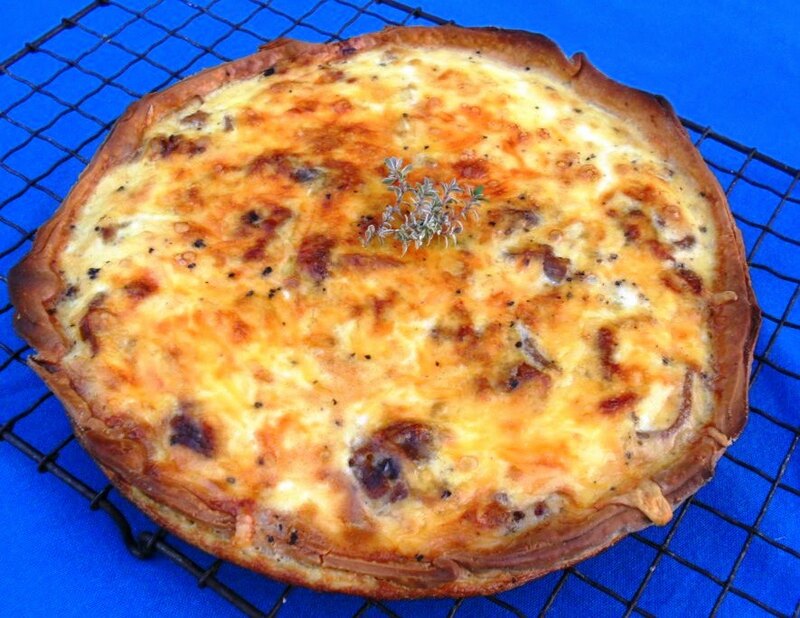 You can make twelve small quiches or one large 28cm quiche. On the day the pictures were taken I made six small ones and this rectangular one. The tomatoes are roasted for extra flavour. Butter 1 large 28cm quiche pan or 12 small quiche pans with butter or with a cooking spray. Place the cake flour and butter into a food processor and process until crumbly. Add the water and process, until it forms a dough. 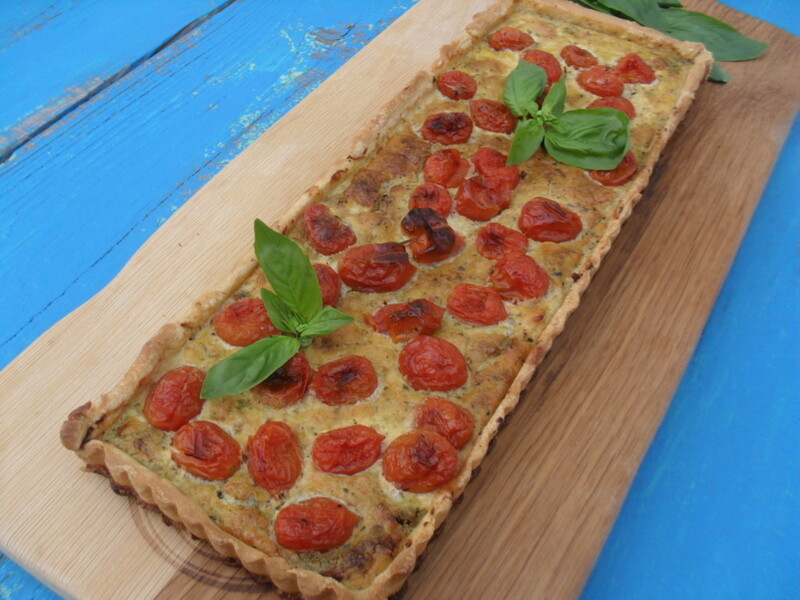 Roll the pastry out onto a lightly floured surface and line the basis of the quiche pan with the pastry. Place in the fridge and chill for 20 minutes. Prick the pastry cases with a fork and line with baking paper. Fill with baking beans and blind-bake in the pre-heated oven for 20 minutes. Remove the baking paper with the beans; return to the oven and bake for another 10 minutes. 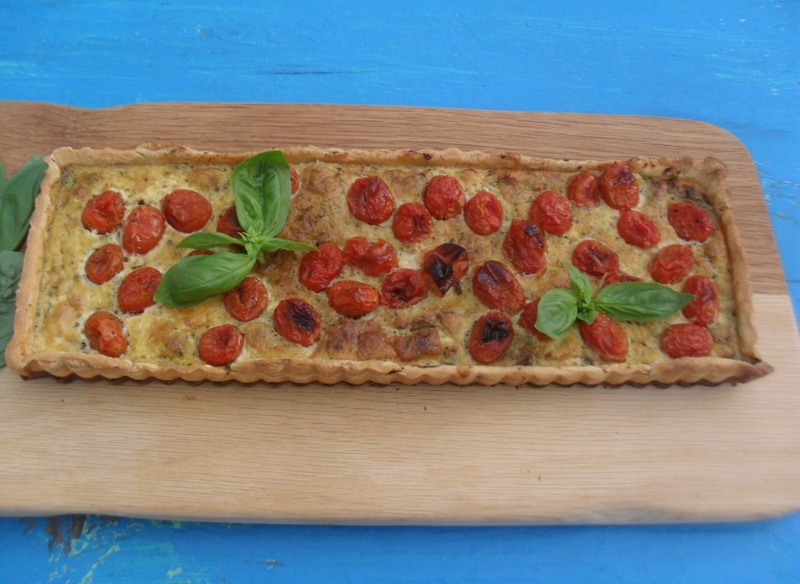 Place the cherry tomatoes into a roasting tin and drizzle with the olive oil. Place with the tart cases in the pre-heated oven and roast for 20 minutes; remove with the tart cases. Whilst the tomatoes are roasting, beat the eggs, cream and chopped basil together and season with salt and pepper. 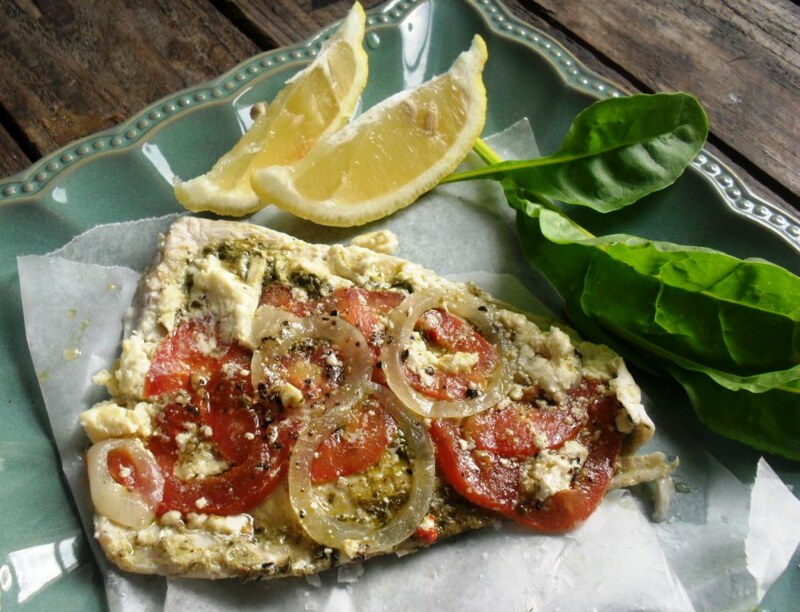 Sprinkle half of the Parmesan cheese into the bottom of the tart cases. Scatter the roasted tomatoes over the basil pesto. Pour the creamy-egg mixture over. Top with the remaining Parmesan. Bake for approximately 25 minutes until the creamy-egg mixture is set. Serve hot or cold garnished with extra basil leaves.